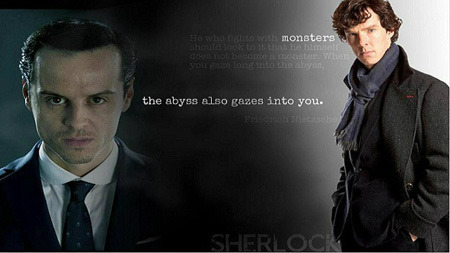 BBC Sherlock Fan Forum - Serving Sherlockians since February 2012 » RAT. WEDDING. BOW. 16:19And here's what we've been waiting for - the three words that describe the episodes of Sherlock series three - Rat, Wedding, Bow. That's RAT. WEDDING. BOW. What does it mean?! Get Googling! Well "Rat" seems to work with The Adventure of the Empty House. The "Wedding" could be that of John Watson & Mary Morstan, or not. There are quite a lot of marriages in the stories. But "Bow"? I mean it's just too early for His Last Bow, right? Crime in Progress. Please Disturb. For me, clearly "The Adventure of Charles Augustus Milverton". Sherlock, becoming engaged to Milverton's housemaid to marry her. Thanks tobe. I feel somewhat relieved Will read the Milverton story tonight as soon as I get home. The Boscombe Valley mystery has an indirect reference to a rat. Wedding could be The Noble Bachelor where the groom disappears, leaving the bride at the altar. It could also be a reference to The Sign of the Four, where John meets Mary, and this leads to John's wedding. It could also reference The Illustrious Client, though A Scandal in Belgravia had a reference to this case in the meeting between Sherlock and the liaison. There's also The Solitary Cyclist, which has a sham wedding in the end, as well as The Disappearance of Lady Frances Carfax, but it's more of a tangential reference to a wedding. I think the creators goal is to reference each case in the canon either directly, by basing the episode on it, or indirectly through colorful references. Well, bow could be bow as in "His Last Bow", the last adventure of Sherlock Holmes chronologically, taking place during World War I. This would be fitting if the episode is meant to be the end of the series. Is the foil of a detective a thief or a magician? Bow could be a bow of a ship too, or what you fire arrows with. Rat could be a reference to Lestrade I suppose if you refer to the canon description. Wedding? John's or perhaps the callous engagement? Just thinking here. Quite how the ship, the mammal, and the Indonesian island are associated is not specified. There are a number of species of large rats on Sumatra, with one, Sundamys infraluteus, actually being referred to as the "giant rat of Sumatra". Rats commonly colonise ships, and so there is an obvious line of speculation. I knew the Giant Rat of Sumatra stuck in my mind because, of all the canon stories, I just happened to read 'The Adventure of the Sussex Vampire' two weeks ago. The Rat might be promising for that reference - a story for which the world is not yet prepared! Not only exciting but also "could be dangerous" . Anyway, I'm putting my bet on the giant rat (as envisioned by the Moftiss). I don't recall any stories in the canon that have to do with a bow as in a bow and arrow. Bow for a ship could refer to the Gloria Scott or Abbey Grange, though it seems less likely given that "Woman, Hound, Fall" were rather overt references. If one wants to go with the giant rat angle, one could imagine an interesting combination of The Empty House and The Speckled Band and/or The Sign of the Four that plays off a large rat creature. If Wedding refers to John's wedding, the Sign of the Four is the story that sets it up. Just thought, what if it's invidudual lettters like H.O.U.N.D.? At least one or two of them? RAT. Quite possible "The Boscombe Valley Mystery", as not only there is an important reference to "Rat" in the story- which was short for Ballarat- but a secondary character, a fourteen-year-old daughter of the lodge- keeper is called Patience Moran. I am sure it was just coincidence/ forgetfulness on part of Conan Doyle, but can see Moftiss making a thing out of it and combining "Empty House" with "Boscombe Valley" to deal with Sebastian Moran. I'll have to re-read "The Sign of Four" to recall the rat reference there. "Wedding" is the most ambiguous one. There are tons of cases featuring near-weddings, unhappy weddings etc. 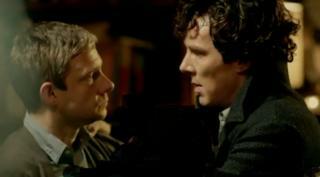 And, of course, there is Sherlock's engagement in Augustut Milverton" ( which I'd OVE for them to tackle!) and John's very real wedding to Mary Morstan. I'll have to come back to this one later. "Bow". Most probably refering to "His Last Bow". Why? Becasue Moftiss wants us in hysterics that it's Sherlock's last case. So many articles say that's when Sherlock goes into retirement, which of course is false- that when he comes out of retirement. I do not believe for a second that they'll definitevely bring the series to an end. They might put it on hiatus- who knows- but this toy is too fun- not only for us, but for them as well. But didn't they tell the plane fangirl they wouldn't marry John? Folks who were at the event said it was "bow" like "Take a bow"
I assume that's referring to how Moffat pronounced the word. So that eliminates, e.g., bow and arrow, violin bow, ribbon bow, bow tie, rainbow (etc., I'm sure! ), and narrows it down to take a bow or bow to authority (or other related meanings) and ship's bow. If one wants to go with the giant rat angle, one could imagine an interesting combination of The Empty House and ... The Sign of the Four that plays off a large rat creature. If Wedding refers to John's wedding, the Sign of the Four is the story that sets it up. Interesting. Have been meaning to read that one anyhow. ... I had a sudden attack of fangirl feels when I was chatting about series 3 with Mark and I kinda blurted out ‘Please don’t marry off John Watson!’ and he just smirked and said ‘I’m not going to marry John Watson!’ and I died. 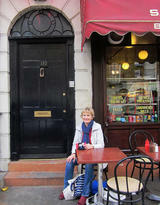 ... which I take to be Gatiss saying that he himself would not marry John! 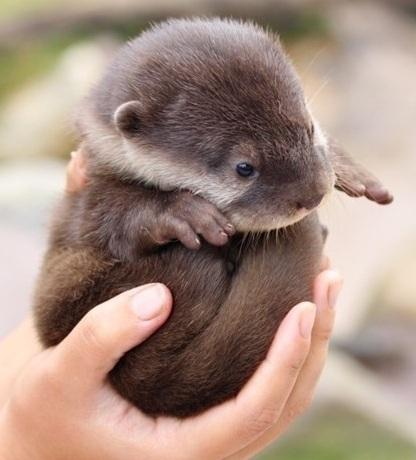 I bow to your superior deduction (well, induction) skills on this one! I blush. However, just because Moftiss didn't say that the scripts wouldn't does not necessarily mean that the scripts will! ok those three words make less sense than WOMAN, HOUND, FALL. I've posted my ideas on the theories of those words in another thread-- I'll post them here. ok I gues PIPE, SLIPPERS, and BED were red herrings, right? Now, let's take the word Bow. His Last Bow was when Sherlock came out of retirement for one last case. OR it could be something about his Violin Bow. OR the BOW street Runners (irregulars in the canon-- a little group of boys who do errands for Sherlock occasionally) BUT what if the spelling is wrong? What if Steven meant it as BEAUX (which means boyfriend, to me) Hmmm? The Mofftis Circle are just .....brilliant to play us fans like this!! I don't know whether to kiss them or smack them. The great Rat Of Sumatra--this was a story that was alluded to but never written up. His Last Bow, of course. 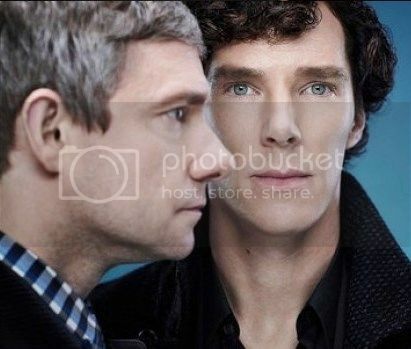 That's the one where Sherlock goes somewhere to find something, only he's in disquise as someone else. three pipe problem? Red Headed League, which was done before with Jeremy Brett--So I doubt it. Can't think of anything else. OR it's the same thing to Three patch problem which was in Study In Pink. Slippers--Sherlock looks for Tobacco in a slipper-- wasn't that done in HOUNDS? Oh, bow! Like an actor takes a bow at the final curtain call. Not the bow of a boat. Not a big red bow on a birthday present. Not an archer fitting a shooting arrow into a bow.